Just off Milestone Road, but before you get to Siasconset, is the quiet neighborhood of Tom Nevers. Most of the homes are relatively new and well equipped with amenities. Residents and visitors love the privacy and country setting of this area, 67% of which is conservation land. Tom Nevers is far enough away from the hustle and bustle of Town, but close enough to be convenient. Tom Nevers Beach, located at the end of Tom Nevers Road, is set at the foot of low cliffs. Because it is not well known, or easily accessible, visitors are ensured of a quiet, private day at the beach. 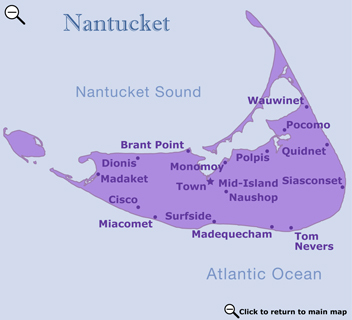 The annual Nantucket Island Fair is held every fall at Tom Nevers Fairground. This weekend-long fair draws about 1,500 people per day. Popular activities include hay rides, petting zoo, dog show, local craft fair and flea market, pumpkin contest, square dancing, and samplings of local produce.